"Kapusta is a great side dish at any meal and even makes a great main dish for vegetarians. This recipe was passed down by my Polish grandmother. I grew up with it at every holiday meal and just love it. 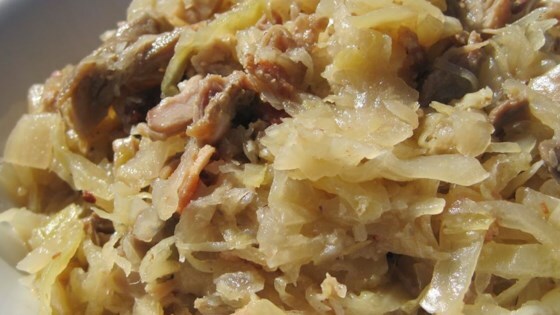 Sauerkraut takes on a whole new flavor when baked and is really delicious! Try it and see for yourself!" Heat 4 tablespoons of butter over medium heat; saute onions and mushrooms until tender. In a medium saucepan over high heat, boil cabbage for 10 minutes. In a 9 x 13 inch baking dish combine onions, mushrooms, cabbage, sauerkraut, sugar, thyme, salt and pepper; mix well. Dot remaining 2 tablespoons butter on top. Cover. Bake in preheated oven for 1 hour, stirring every 20 minutes. a very different unique taste. added sliced polska kielbasa to the mix, and then baked. gave it a very good smoky taste. will definitly make again.